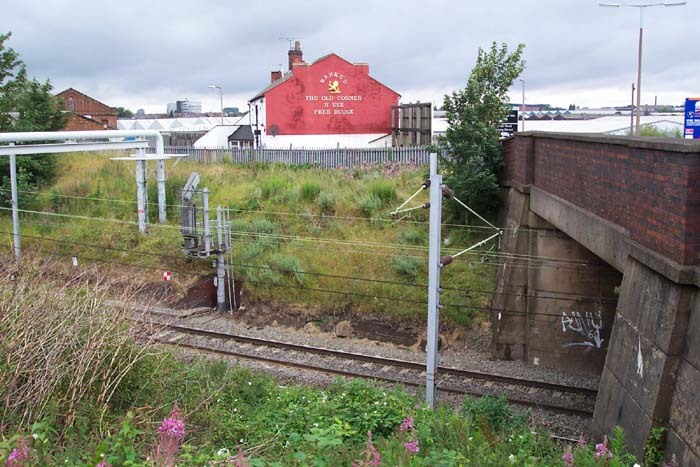 Soho opened on the LNWR's New Street to Wolverhampton High Level line in 1867 and fared considerably less well than the other closed stations on this line (with the exception of Monmore Green), closing as it did in 1949. A lot of remodelling of the roadways here has been undertaken with road alignment and size considerably altering thus it is difficult to get the feel of the site as it was. 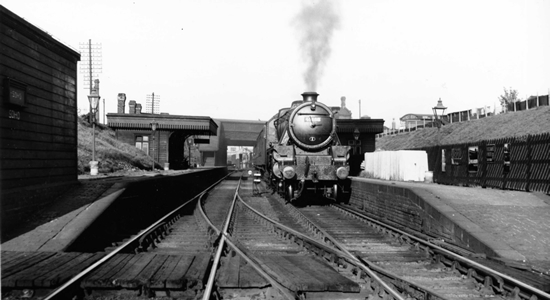 Above we see the station on 14/05/49 as the last train out of the station - on a Wolverhampton - Stoke local service - prepares to depart (photo: TJ Edgington). Above-left we are standing on Soho, looking towards the spot once occupied by the station entrance. The clues as to the station's existence are virtually non-existent today. The usual telltale sign of a different coloured section of brickwork in a blue-brick bridge parapet indicating the bricking-up of the gap left in walling when the station building or entrances were removed is not in situ here. This appears due to the bridge having been replaced, the brickwork not being contemporary of the station's period of construction. This fact is borne-out on either side of the bridge to the rear of the photographer whereby the bridge section itself is flanked by blue-brick walling but the bridge section itself is in the same brick as seen in the above view. 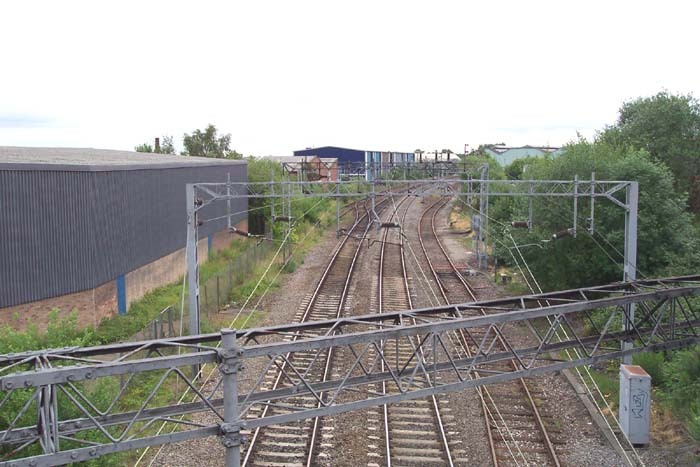 Above-right we are looking down from Soho bridge (previously named Soho Street) to the site once occupied by the platforms: we are looking towards Smethwick Rolfe Street which, incidentally, was up and running 15 years before Soho opened and is only a very short walk away. 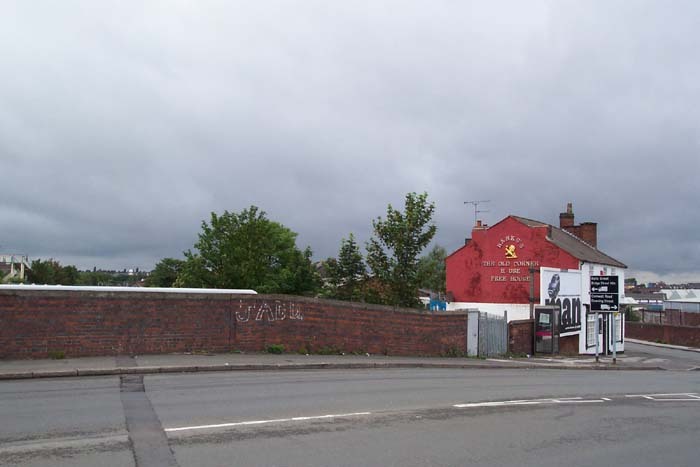 Above-left we are standing on the corner of Soho and Soho Way, roughly where Hill Row appears on the map page, looking across to the site of the Birmingham platform. 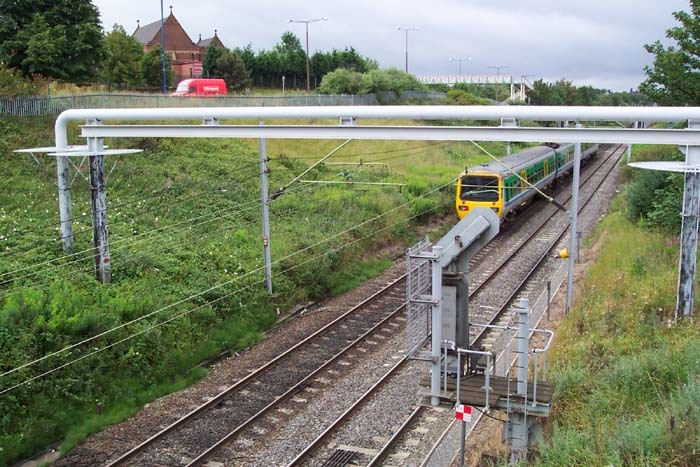 Above-right we are standing on Soho overbridge with the station site to our rear looking towards Birmingham. The units to our left occupy the area that once housed the goods shed and sidings, a relic of which can bee seen in the distance in a siding seemingly going nowhere. The site is not one I'd recommend as the slum clearance and ring road building escapades of the 1950s and 1960s has rendered the area largely unrecognizable and the station itself has long-since been swept away.